Crazy Egg makes it easy to share Snapshots with your team members. There are two ways to share your Snapshots. You can either send a public Share Link or invite new team members to your Crazy Egg team. 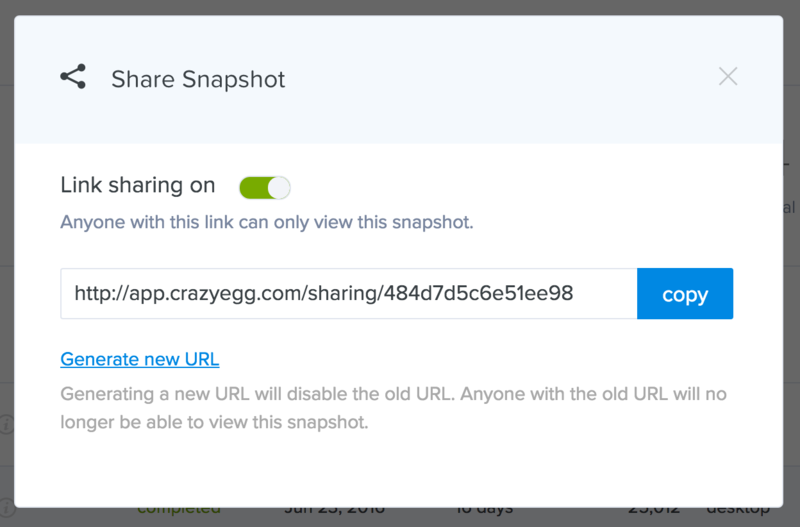 In this article, you'll learn how to share a snapshot by sending a public Share Link. 1. Click on the Snapshots tab in the left navigation. 2. Mouse over the Snapshot and click on the gear icon under Actions. 3. Click on Share this snapshot. 4.. You will see a Share Link pop-up with the Link sharing on (green toggle). Click on copy and send the link to someone. 5. Click on the X in the top right-hand corner to close the window. 1. While viewing the Snapshot that you want to share, click share. 2. You will see a Share Link pop-up with the Link sharing on (green toggle). Click on copy and send the link to someone. 3. Click on the X in the top right-hand corner to close the window. Note: As long as you have toggle green, anyone with the link will be able to view the snapshot reports. To stop sharing, toggle Link Sharing On to off (grey).